The Shinese is a designer hybrid breed consisting of Pekingese and Shih Tzu. The breed originated in recent years in the United States, however, both the Shih Tzu and the Pekingese originated in Tibet. The purpose behind creating designer hybrids is typically to attempt to breed out some of the health risks associated with the parent breeds. It is not uncommon for puppies from the same litter to look quite different, as often the puppies will take on physical characteristics resembling more closely one parent or the other. The Shinese is a relatively new designer breed, making information about the breed itself scarce. If you have further questions about this breed, consider contacting one of the accepted registries or a Shinese breeder. The Shinese can currently be registered with the American Canine Hybrid Club, Designer Dogs Kennel Club, International Designer Canine Registry and the Designer Breed Registry. However, the Shinese is registered as the Peke-A-Tzu under the International Designer Canine Registry. The Shinese will typically reach heights of about 10 inches with an average weight of 9-16 pounds. However, this may vary depending on the size of the parent dogs. The coat of the Shinese typically resembles human hair, and will appear as a long double coat. The coat can also come in a wide variety of colors exhibited by the parent breeds of Shih Tzu and Pekingese. Red, white, beige and black are common colors, but these colors may appear in a variety of solids or mixtures. And as always, you must keep in mind that with a designer hybrid, you never quite know exactly what you'll get. The Shinese is a very loving and playful breed. They will be eager to exert their little excess energy and then spend the day lounging. The Shinese is revered as an ideal pet for elderly people looking for a lap companion, as they are quite calm. The Shinese can also make a great family pet, however, homes with very small children are not recommended. The Shinese is a very small breed, and could be very easily harmed by a small child unaware of their strength. The Shinese, though small in stature, are large in heart and are known to keep a watchful eye on their loved ones. A surprisingly able watchdog, the Shinese will stay alert and be the first to let you know of an uninvited presence. Being part Pekingese, the Shinese does have a propensity for stubbornness. They will not likely respond well to harsh discipline without the proper mixture of loving praise. The Shinese is a very loving and playful breed. They will be eager to exert their little excess energy and then spend the day lounging. The Shinese is revered as an ideal pet for elderly people looking for a lap companion, as they are quite calm. The Shinese can also make a great family pet, however, homes with very small children are not recommended. The Shinese is a very small breed, and could be very easily harmed by a small child unaware of their strength. The Shinese, though small in stature, are large in heart and are known to keep a watchful eye on their loved ones. A surprisingly able watchdog, the Shinese will stay alert and be the first to let you know of an uninvited presence. Being part Pekingese, the Shinese does have a propensity for stubbornness. They will not likely respond well to harsh discipline without the proper mixture of loving praise. The Shinese is a mix of the Pekingese and the Shih Tzu. A mixed breed dog can have a combination of any of the temperament and characteristics of any breed involved. It is recommended that you thoroughly research all breeds involved in your mixed breed puppy to ensure that you are amenable and prepared for any of the possibilities. You can find Peke A Tzu puppies priced from $450 USD to $800 USD with one of our credible breeders. Browse through our breeder's listings and find your perfect puppy at the perfect price. 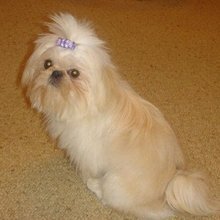 The Shinese is a mix of the Pekingese and the Shih Tzu. A mixed breed dog can have a combination of any of the temperament and characteristics of any breed involved. It is recommended that you thoroughly research all breeds involved in your mixed breed puppy to ensure that you are amenable and prepared for any of the possibilities. The Shinese are not for the undedicated groomer. This breed exhibits a long and full coat requiring a great deal of attention. The coat will require frequent brushing (at least every couple days), as well as monthly baths. The Shinese's face will need to be wiped after feeding to ensure there are no lingering food particles and the ears should be cleaned regularly. Also, due to the nature of the Shinese's coat and short muzzle, they may have difficulty regulating their body temperature. It is necessary to keep a close eye on your Shinese in extreme heat, and it is not recommended to leave the puppy outside for prolonged periods of time. The Shinese is a very intelligent and eager to please breed. They will take direction, however a stubbon nature is not uncommon and will require patience. If you intend to have your Shinese around children and other pets, the puppy should be introduced and well socialized from a very young age. The Shinese is an ideal pet for those apartment dwellers. This breed requires very little exercising. Daily walks are more of a treat than a requirement. Your Shinese will be perfectly happy to simply catch some fresh air on the patio and head back inside to lounge about. Peke A Tzu Puppies for Sale - Shipped Worldwide! Finding the right Peke A Tzu puppy can be dog gone hard work. PuppyFind® provides a convenient and efficient means of selecting and purchasing the perfect Peke A Tzu puppy (or Peke A Tzu puppies) from the comfort of your home, 24 hours a day, 7 days a week. Take advantage of our PuppySearch or leisurely browse our directory of hundreds of dog breeds, Peke A Tzu dog breeders, Peke A Tzu dogs for adoption, and Peke A Tzu puppy for sale listings with photos and detailed descriptions. Some Peke A Tzu puppies for sale may be shipped Worldwide and include crate and veterinarian checkup. Many Peke A Tzu dog breeders with puppies for sale also offer a health guarantee. With thousands of Peke A Tzu puppies for sale and hundreds of Peke A Tzu dog breeders, you're sure to find the perfect Peke A Tzu puppy.